Toy manufacturer Yoxo recently installed a second waterjet-cutting system from Jet Edge, to meet skyrocketing demand for its creative toy construction kits. Included is a shuttle system that allows unloading of parts while the machine continues cutting, thus doubling productivity. Yoxo (“yock-so”) kits inspire kids to design and build their own toys using Y-, O-, and X-shaped links that connect with everyday household items such as toilet- paper tubes, paper towel rolls and cereal boxes, according to Yoxo officials. The Yoxo links also can be attached to other connector toys such as Legos, Kre-os and Mega Bloks. The toys are made in the company’s wind-powered workshop in St. Paul, MN, where the links are waterjet-cut from colorful sheets of locally sourced recycled wood fiber. Initially, Yoxo cut its connectors using laser cutters, but the lasers burnt the edges of the material, resulting in hours spent cleaning parts. And, buying multiple lasers to increase production would have been cost-prohibitive. “Parents don’t want their kids playing with sooty toys, so we needed a better solution,” Freeland Nelson, Yoxo owner, recalls. With contracts then in negotiation with Target and Barnes & Noble, Yoxo sought a more productive way to cut its parts. The company tested a variety of cutting technologies before concluding that cutting its water-adverse material with 55,000-psi jets of water was, oddly enough, the most effective solution. 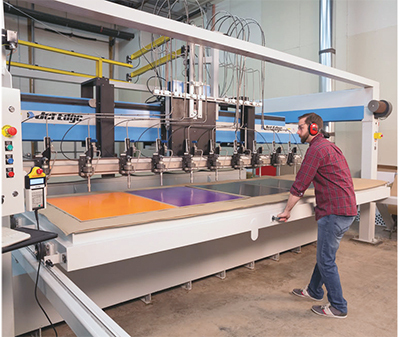 It turned to Jet Edge, St. Michael, MN, for a custom-engineered system, taking delivery of its first waterjet cutter in late-2014. “We saw a 15 to 20-percent productivity gain without sacrificing quality after switching to the waterjet,” recalls Trevor Burns, Yoxo director of production. A year later, the growing company needed a second system and decided to take production goals a step further by installing a high-production Jet Edge high-rail gantry shuttle system with 10 OmniJet waterjet-cutting heads. The custom-engineered shuttle system maximizes productivity by allowing Yoxo’s operators to continue cutting as parts are unloaded. The new system also features a custom slanted tank with a blow-down option, a feature that Yoxo also had retrofitted to its first waterjet machine. The slanted tank makes it easier to clean out pulp debris, while the blow-down system helps hold material in place during the cutting process. “This has drastically cut down on tank cleaning and increased the quality of our cuts by almost completely eliminating splash-back onto our products,” Burns says.